When I got the call to come back on Kroll Show for my third sketch in two seasons I was ecstatic! When I found out I’d be playing myself in a red carpet sketch I was beyond words! I just made signs to people but I couldn’t actually speak! When it comes to doing characters, Nick Kroll is in a class of his own, which may sound lonely, but it’s not because the class is full! It’s populated with such diverse characters as Dr. Armond, C-Czar, Bobby Bottleservice, Liz G., Fabrice Fabrice, Ref Jeff, Gil Faizon, … the list is endless! And to be in his presence and see him BECOME the character is even more amazing. 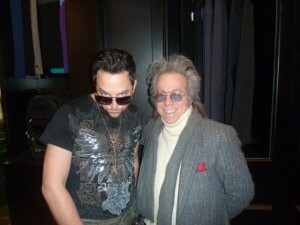 Jeffrey Gurian of Comedy Matters TV with Nick Kroll as Bobby Bottleservice, one of the most amazing characters he does! When he is Dr. Armond, canine plastic surgeon, the stare that inhabits his face is uncanny! For the period of time that he’s in that character Dr. Armond truly exists. Nick makes him real. The same with all the myriad of characters he does! 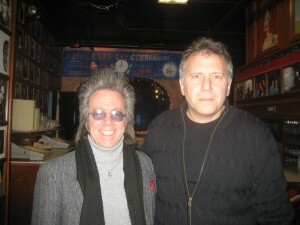 Jeffrey Gurian of Comedy Matters TV with Paul Reiser in New York City! Reiser showed up on the set anyway as he was asked to do and when they broke for lunch he said he didn’t know where to sit, with the cast or the crew because since he had no lines, he didn’t know if he was entitled to sit with the cast! Turns out that Barry Levinson created his part for him while he was there, and that was his foray into the big time world of movies. They improv’ed it, and that was it! That’s what wound up happening with me on Kroll Show! When I got to the set, 2nd 2nd AD Toby Burge showed me to my trailer exactly like he did last year, and I felt like I was home again! This year instead of it being labeled “Tuna Jeff” for my stint in “Too Much Tuna” it was simply labeled “Gurian” since I was playing myself, a part I feel I was born to play! Then producer Inman Young came by to welcome me back to the set. It’s such a friendly place, and everyone was so gracious. I went to lunch, and joined Exec. Producer John Levenstein and we were soon joined by Exec. Producer/Director Jon Krisel, of Portlandia fame, and the three of us had a lot of laughs over lunch. (L-R) Exec. 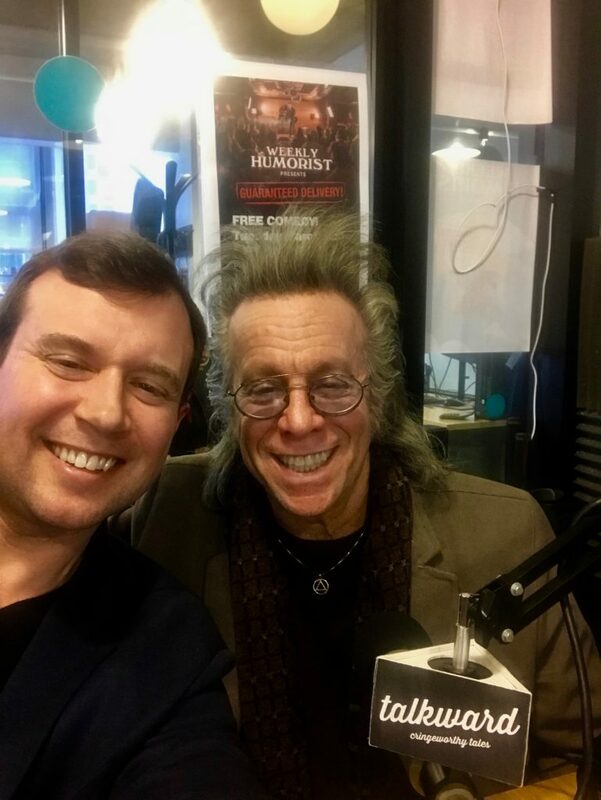 Producer/Director Jon Krisel, Jeffrey Gurian of Comedy Matters TV, and Exec. 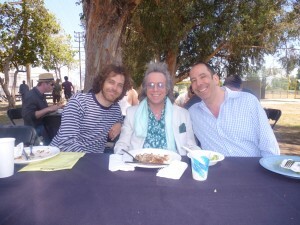 Producer John Levenstein at lunch on Kroll Show! Once again they thought the outfit I was wearing was what I had brought to wear on the show, but I explained that I always dress that way, and that I had something special and very happy looking in mind for the red carpet. 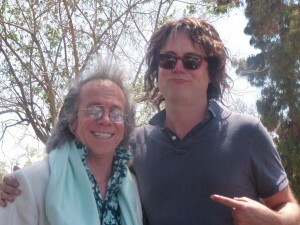 Jeffrey Gurian of Comedy Matters TV in his original daytime outfit he wore to lunch on Kroll Show with Co-Exec. Producer/Actor Jon Daly in the wig he’ll be wearing later on in the sketch! Since I got the call to come out to LA I had the feeling that I wanted to wear white suede shoes on the red carpet with a bright colored jacket. I had a royal blue jacket all picked out with a matching shirt and scarf, white jeans and two tone shoes, white and blue, but I really wanted white suede shoes. I looked all over and couldn’t find any. 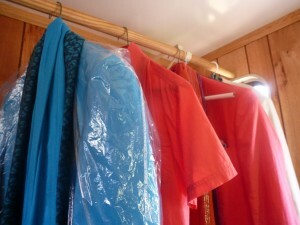 The choice of colorful, fun outfits and scarves I brought for the red carpet scene on Kroll Show! I’m shopping on Melrose Avenue two days before the shoot, find a spot in front of an Aldo shoe store, walk in and what do you know, … they have white suede shoes! But not in my size! And the girl says they don’t make them any more. They’re discontinued! I guess I looked very sad so she was nice enough to call another store, and they had one pair left that just happened to be in my size! But they were an hour away, and one shoe was very discolored due to being left out in the sun on display. 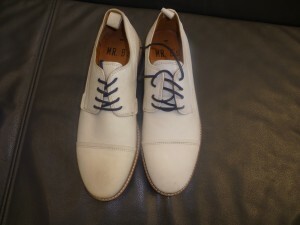 The white suede shoes in the “pre” state with one very discolored shoe! Not anymore!!! However the manager said if I was willing to drive out there he’d give them to me for 10 bucks! Ten bucks for $200. shoes I couldn’t pass up, so I drove out there, got the shoes, and the guy told me he thought that if I brought it to a shoe repair shop they could probably get the color back. I figured the most I could lose was ten bucks. Why not? That’s like going to a neurosurgeon and asking him to cut your nails! Sure enough the next day on Monday, I found a tailor near my hotel who fixed the sleeves for me the same day so I could have them for the shoot, and when he found out I was in the comedy world he asked me if I knew Kevin Hart. 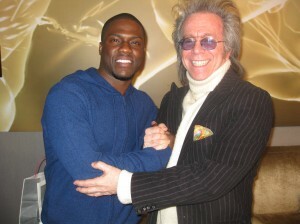 Jeffrey Gurian of Comedy Matters TV with Kevin Hart at a promo event for the show they were doing together at Westbury Theatre! I told him I co-produced a huge comedy show starring Kevin back in 2010, and he told me that Kevin comes in almost every week to have his clothes fixed. So one day before the shoot I got both the shoes and the jacket that I wore on set. Then Jon Krisel decided to put me in every scene, only made more special by the fact that there were HUGE stars on set that day. I’m sworn to secrecy about who they were until the show comes out, but trust me, they were huge in music, film and comedy! EVERYBODY wants to be on Kroll Show! And I got to interact with each one of them on the red carpet! And this is where I would place a photo of them if I was allowed to, so just picture in your mind the biggest stars you can think of and that’s what goes here! Picture the biggest stars you can think of and place them right here! BLANK SPACE FOR HUGE STARS!!! 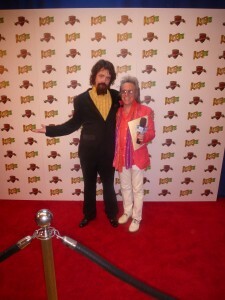 A full view of Jeffrey Gurian of Comedy Matters TV with his white suede shoes, and Jon Daly on the red carpet! 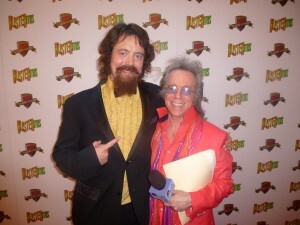 My opening line was, “Hi, I’m Jeffrey Gurian from Comedy Matters TV!” I even had my own dedicated camera! Jon Krisel said, ” Give Gurian his own camera”, and it was done! Thank you Nick Kroll, and Jon Krisel! All I can tell you is that it was a Pub-LIZ-ity sketch with Nick in character as Liz G. and Jon Daly, as a country bumpkin named “Don” who was dressed as if he was attending a prom in Civil War times! I haven’t seen a beard like that since the War of 1812! Jon, one of the many Jons/Johns on the show is also a co-Exec. Producer besides being an actor on the show, who plays Wendy Shawn in Rich Dicks and Peter Papparazzo, in the Ed Hardy Boyz sketch. After it was all over, Nick turned the tables on me and interviewed ME in the make-up trailer as he removed his Liz G. makeup. He was so tired from a full day of shooting that I didn’t even ask if I could shoot something with him on my own camera. I love to capture special moments like that, but it would have been too much, and between you and I, I was just so honored to be there! I felt like it went really well and I got great reviews from the powers that be. It really meant a lot to me. And just today I got an invite to the wrap party for the cast and crew of Season 2! I’m almost tempted to fly out there for it! 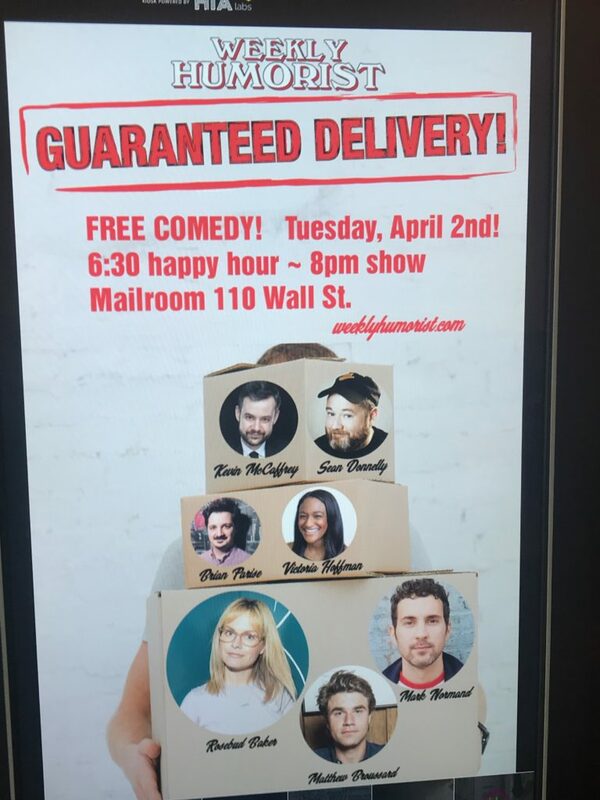 I’m sure it’ll be a blast!